Some dreams come with a big price tag. Fifteen years later, Bailey’s back–shattered, humbled by fate and bruised at the soul level but determined to rebuild–once she helps her parents get back on their feet. She didn’t expect Paul Zabrinski to meet her plane, but seeing him strong, handsome and successful is somehow fitting. After all, Bailey didn’t need Paul’s gypsy great-grandmother to put a curse on her–Bailey already had the worst luck on the planet. One look at Bailey Jenkins–his first love, the woman he adored…and cursed–and every emotion Paul Zabrinski felt fifteen years earlier comes rushing back. The love of his life broke his heart and made him hate her…or so he thought. The line between love and hate is very narrow, with only so much room for forgiveness. But Paul Zabrinski owns Big Z Hardware and Construction. If anyone is capable of building a bridge for them to cross together, it’s him. amily, friends and forgiveness. I absolutely loved this book, the story of Paul and Bailey. Young love that was separated and then reunited fifteen years later. Both with failed marriages after a decision that was made many years ago, thinking you did what was best at the time. Bailey returns home to help her parents where she is reunited with high school sweetheart, single parent Paul. This book brought me in immediately, what you don't do for your family when you are young. Loved the family dynamics of Bailey's family, so many problems that need to be worked through. Paul is just awesome, so in love with Bailey. Now Austin, PITA! 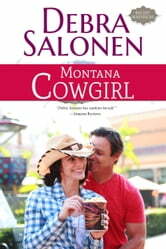 I love the Montana Born Fair books, take me to fair now! "Montana Cowgirl" by Debra Salonen is book one in the "Mavericks" series. This is Bailey Jenkins and Paul Zabrinski's story. Bailey and Paul were high school sweethearts, but circumstances split them up. They went their separate ways. Fifteen years later Bailey is dealing with recovering from a horrible wreck that also killed her husband. Bailey's relationship with her dad is not good, but she is back to help her mom with her dad who has lost part of his leg. Paul has a successful business and two great kids but he and his wife are divorced. Bailey's mom arranged for Paul to pick up Bailey from the airport. They both still have feelings for each other. Will they be able to forgive each other, overcome the hurts from the past, and the obstacles in their life? This is a second chance romance that deals with some pretty heavy emotional issues, family dynamics, health issues, and some amazing chemistry between Bailey and Paul. Another great story in Marietta, Montana. You will fall in love with the town and the people.